Legendary investing author and philosopher Benjamin Graham lived through interesting times. Soon after his graduation from Columbia College, the nation entered the First World War. As the stock market fluctuated in wild dips and peaks, the government seized control of the railroad industry, inflation and interest rates rose dramatically, and economic depression loomed on the horizon. During these events―and perhaps inspired by them―Graham began writing articles for The Magazine of Wall Street, putting to paper his earliest ideas on value investing and security analysis. For the first time, these important works have been anthologized into a single volume. Benjamin Graham on Investing is a treasure trove of rare and out-of-print articles that document the early flashes of genius from a man whose ideas and theories would revolutionize investment philosophy and inspire the careers of such luminaries as Warren Buffett, Seth Klarman, Charlie Munger, and countless other top-tier investors. The early works of Benjamin Graham have never been as relevant as they are today. The world’s markets are undergoing changeon a scale not unlike that of Graham’s era. David Darst, one of the world’s most respected experts on asset allocation, provides insightful analyses connecting Graham’s articles to events today. 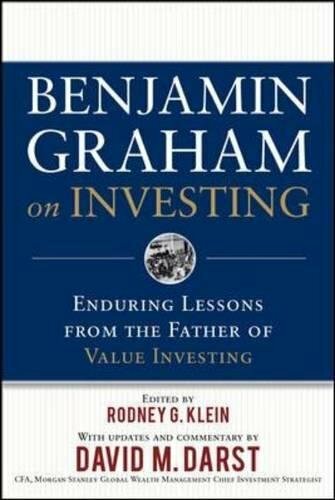 ,i>Benjamin Graham on Investing is a timeless classic that continues to have relevance more than 30 years after the author’s death.